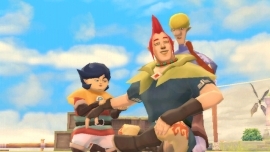 Kyle Bosman, one of my favorite talking heads at Game Trailers, recently stated that Groose was his favorite Zelda character. Of course, no one really cares about that, because the “live ratings” came in and the Final Bosman can’t actually talk about Zelda apparently. If you can’t catch the drift here, it’s pretty much all one big little joke so he can go on and talk about sexism and Bayonetta 2, where he pretty much states that sexism is something that is subjective and will always exist. Which are points I totally agree with. So sure, he talks a bit about Hyrule Warriors and Groose, but really this is about a much more important topic in today’s video game realm. Have a watch and enjoy, because we normally don’t do this. Oh, and Kyle, you’re wrong. Tingle is clearly the best Zelda character.